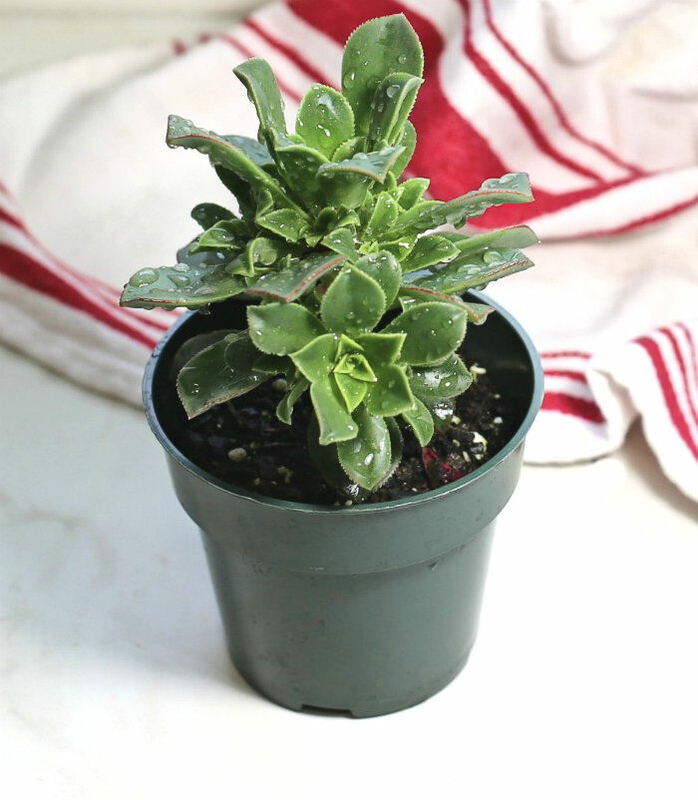 Aeonium haworthii – Kiwi Verde is a showy succulent that has spoon shaped leaves with showy tips and color. It has a rosette shape that is very delicate and popular. 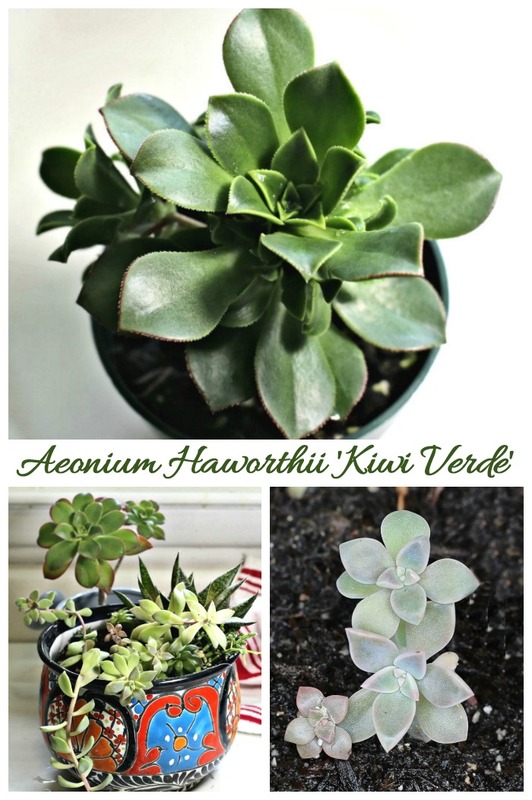 This pretty succulent is also known by several names – Kiwi Verde, or simply Aeonium Kiwi. 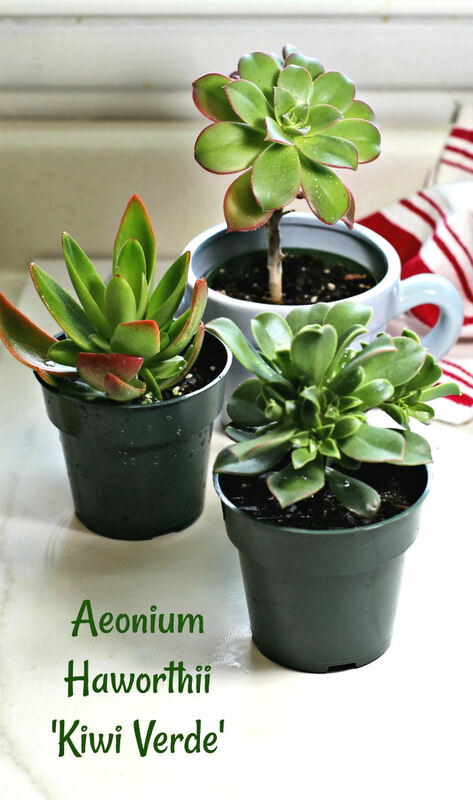 Aeonium succulent is a genus of about 35 species of subtropical succulents of the crassulaceae family. Most are native to the Canary Islands off the west coast of North Africa. Caring for this succulent, and other aeoniums, is fairly easy as long as you understand the growing times and dormancy periods. Unlike some succulents, aeonium does not like really hot and dry weather. If Kiwi verde is exposed to extreme heat, it’s leaves will curl to help prevent too much water loss. If you bring your aeonium outside in the summer months, grow it a shady spot to encourage growth. The plant prefers morning sun or very bright, indirect light. Aeoniums are monocarpic. This means that once the plant flowers, it will die. However, it takes several years for a plant to flower and not all of the rosettes flower at the same time. Kiwi aeonium will grow to about 6 inches wide and 18 inches tall. If you live in an area where the plant will overwinter, Kiwi Verde can grow to a shrub shape that is 2-3 feet tall. 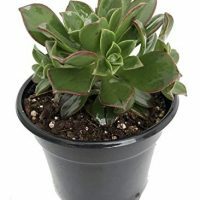 The leaves of Aeonium kiwi succulent are a glossy green with deep magenta edges. The plant has star shaped flowers in the summer months. 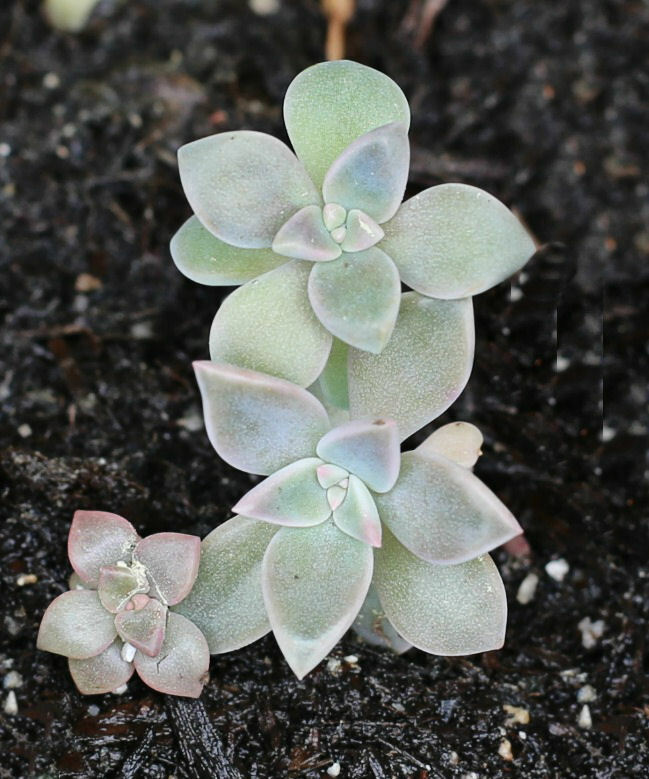 The leaves start as a pale green and get darker as the plant matures. The colors of the foliage will vary depending on sun exposure, time of year and your climate. 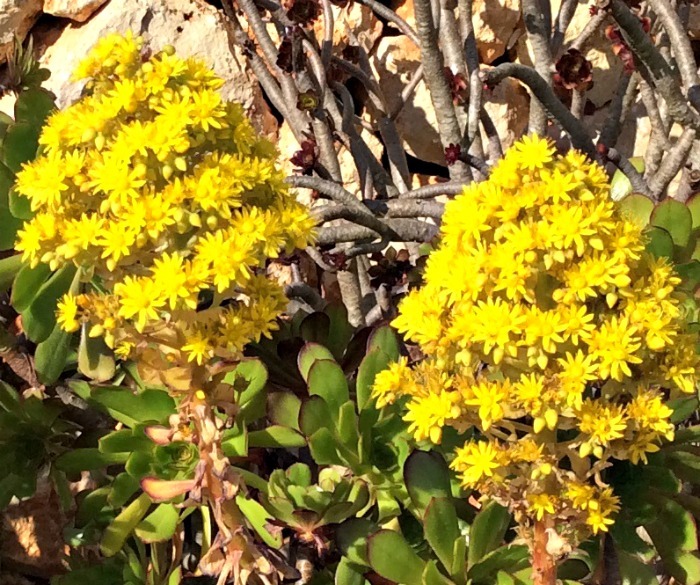 This tender succulent has an interesting growth habit with clusters of rosettes which form along the stem. As the plant ages, the old leaves will start to fall off, exposing the stem area as shown in the picture of the aeonium below. This can make the plant look leggy. If this bothers you, you can take tip cuttings for new plants. 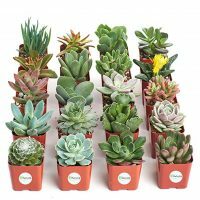 The plant does not grow much during the summer months and does not need any water then, other than in extremely dry conditions. 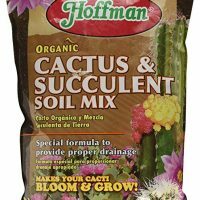 In the winter, when the plant is actively growing, water when the soil is dry if you poke your finger into it down to an inch or 2. While relatively drought tolerant, be sure to give it enough water since it has a shallow root system. 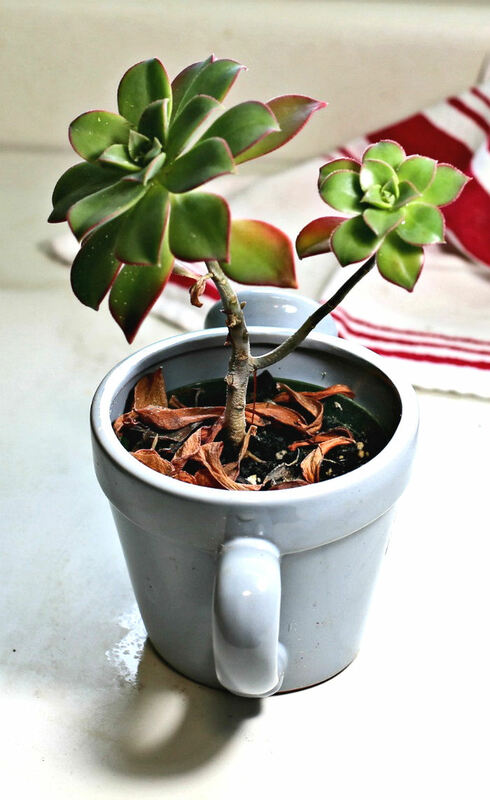 If you give the plant too much water, or allow it to sit in a saucer of water, it can cause the roots to rot. 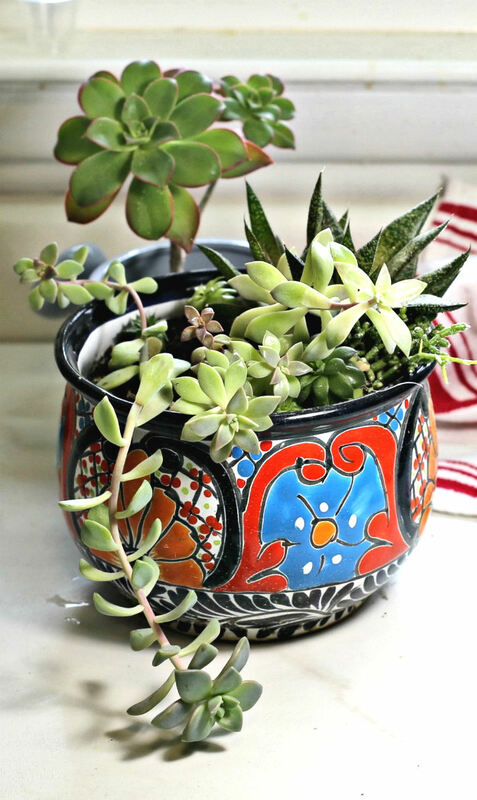 For colder temperature zones, treat the plant as a tender succulent and bring it indoors in the winter. Aeoniums look great in normal pots and are also charming when used in unusual succulent containers. 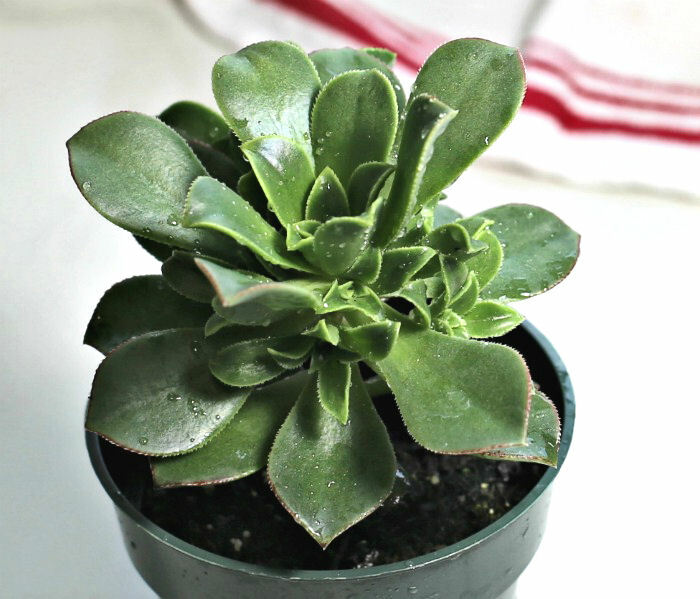 You can get more plants for free, by taking leaf or stem cuttings of Aeonium Kiwi. The cuttings will root anytime during the year, but this happens more quickly in the spring and summer, even though the plant is dormant then. 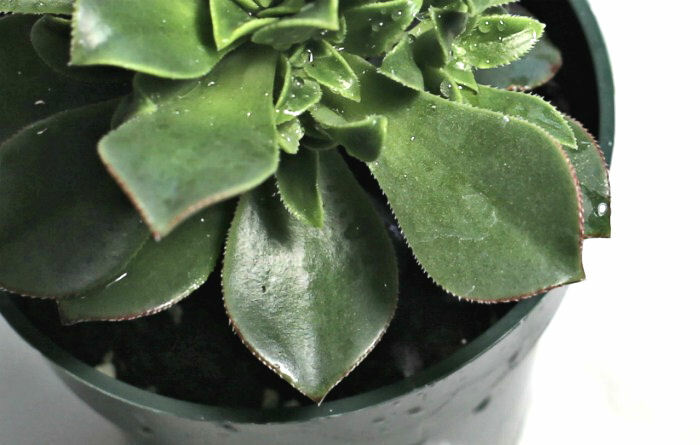 To propagate aeonium, take a tip cutting and place it in a warm spot to dry out and callous over on the tip end. The cutting will develop roots in a few weeks. You can also take off the leaves from where the join the stem and allow them to callous and plant them to get new plants. 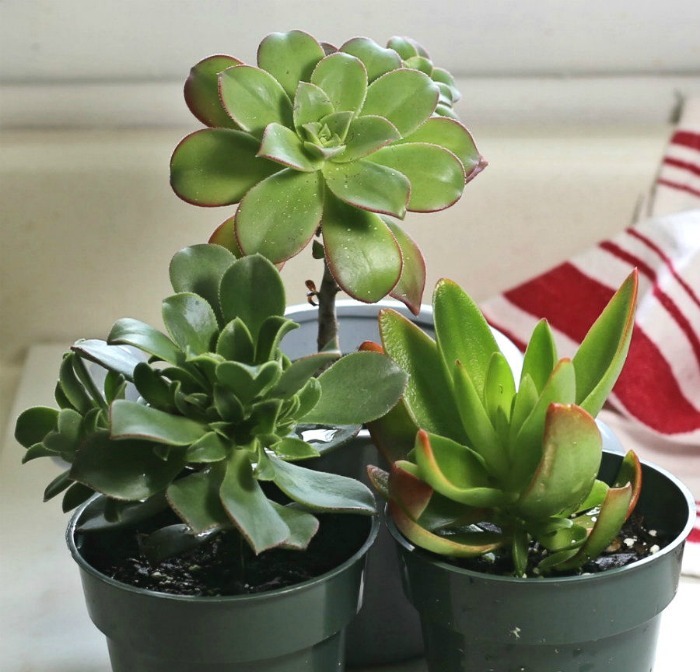 See my tips for growing succulents from leaves and cuttings. Kiwi verde is grown as an indoor plant, and looks great in mixed containers and dish gardens. If you use the plant outdoors in warmer zones, it does well in rock gardens. 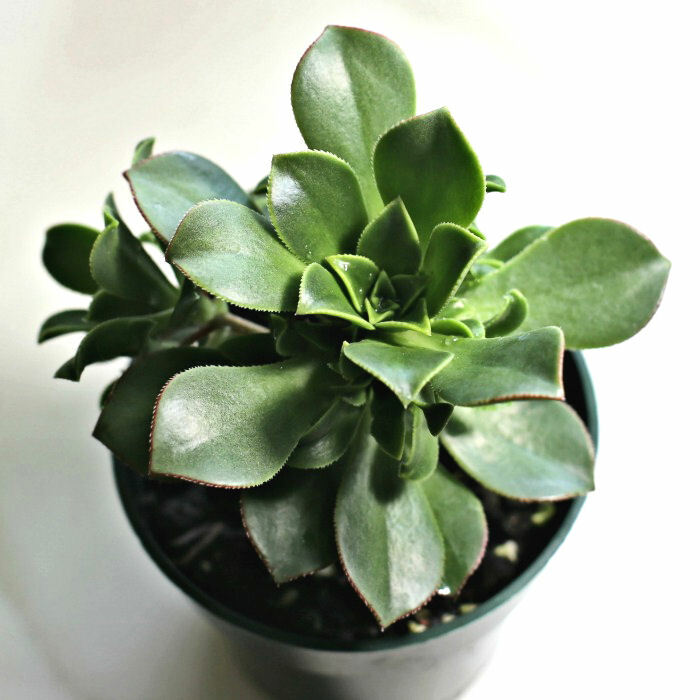 Aeonium kiwi is relatively pest and disease free. Be on the look out for mealy bugs and aphids. It is deer resistant. Would you like a reminder of the care tips for Aeonium Haworthii ‘ Kiwi Verde’? Just pin this image to one of your succulent boards on Pinterest. Aeonium Haworthii 'Kiwi Verde' is a showy succulent that has spoon shaped leaves with showy tips and color.Get some growing tips and see other varieties of aeonium succulents. Print these growing tips for success in growing this plant. Sunlight: This plant needs light shade outdoors. Does not like high heat and temperature. Watering: Water when the soil is dry about 1-2 inches deep. Hardiness: Cold hardy in zones 9a-11b, Does not like frost. Dormancy: Dormant in summer. Grows well in cooler months. 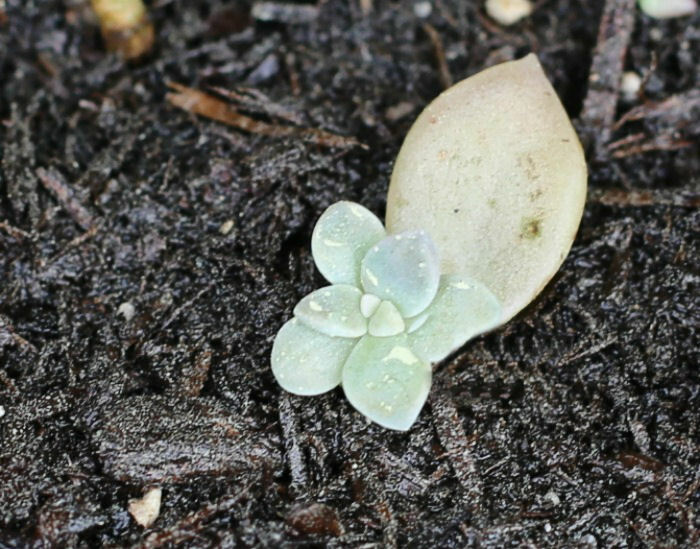 Propagation: Leaf and stem cuttings in the spring and summer months. Pests: Relatively disease free. Watch for mealy bugs and aphids.